The Titans suffered another devastating loss Sunday against the Cleveland Browns but this column isn’t about it. The Titans are a mess right now it’s true but this isn’t as much about the product on the field as it is an indictment of the product’s perception problem among fans and the general public. No one remembers the Tennessee Titans because there is no one in the Titans organization with an understanding of what it once meant to a Tennessee Titan. A common narrative surrounding the Titans is that they lack an identity. I would argue they simply have failed to understand they had one and they failed to protect it or live up to it. The Tennessee Titans did have an identity but the team we see on the field now doesn’t reflect that identity. Indulge me while we take a walk back in time to when Nashville, Tennessee became a host city of an NFL team. Others have written extensively on the background and negotiations involved in the Houston Oilers relocating to Nashville which we won’t go into here. Suffice it to say the Oilers moved to Tennessee in 1997 and were renamed the Tennessee Oilers. Plans had already began for the construction of a new stadium and contests were held for the renaming of the team to a more local theme. It was an exciting time for new fans of the Oilers who embraced the team and even for some old Oilers fans who came along for the ride. The first two years had featured the team playing first at the Liberty Bowl and then at Vanderbilt’s stadium and the team operated mostly out of temporary housing. They would finish 8-8 in 1997 and 1998. Then in 1999 the team was renamed the Tennessee Titans and opened to a capacity crowd at Adelphia Coliseum for the inaugural season on September 12. Thus began a magical year and Adelphia Stadium was rocking during every home game. Fans were so loud there during its heyday the Titans were known as one of the toughest home team environments to play in much like Seattle is today. The Titans won every one of their home games that season including the AFC wildcard playoff game. The team that began an improbable run for the Super Bowl was led by quarterback Steve McNair, running back Eddie George and wide receiver Kevin Dyson on offense and rookie sensation defensive end Jevon “The Freak” Kearse on defense. That season included epic battles between the Titans and the Baltimore Ravens featuring intense match ups between Ray Lewis and Eddie George. The Titans ride through the playoffs featured one of the most iconic plays in NFL playoff history. The Music City Miracle as it became known featured an improbable come from behind victory in the wildcard playoff game against the Buffalo Bills at Adelphia Coliseum in Nashville. The Music City Miracle game featured many compelling storylines. The game was held on January 8, 2000 and the Bills were coached by Wade Phillips, son of the late Bum Phillips and a former Houston Oilers head coach. Phillips firing by Houston Oilers owner Bud Adams, who ironically passed away three days after Phillips during the 2013 season, created a firestorm in Houston and eventually contributed to the team’s move. 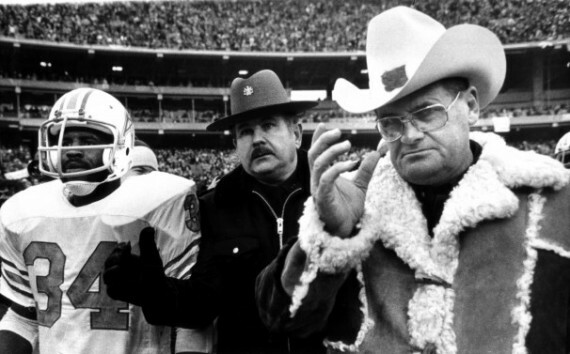 Bum Phillips is known for creating the Luv Ya Blue era of Houston Oilers history. Phillips made the decision to start Brad Johnson over Doug Flutie who had been the starter in the regular season and led the Bills to the playoffs. Johnson was sacked in the end zone in the second quarter by Kearse for a safety which were the first points scored in the game. Later in the 4th quarter with 1:48 remaining and no timeouts, Johnson led Buffalo on a 37 yard drive that featured five plays. The last two plays Johnson played with one shoe having lost one in a scramble. The Bills had no time to allow him to put it back on. The Bills converted a 41 yard field goal putting them up 16-15 with 16 seconds left on the game clock. The Titans took the ensuing kickoff and then something magical happened. Titans fullback Lorenzo Neal took the kickoff and handed it off to tight end Frank Wycheck. Wycheck then lateraled the ball across the field to wide receiver Kevin Dyson who took it 75 yards to the house. It was one of the most exciting plays in franchise history. The play was in fact a designed one but it did not go down as planned. It was the first kick return for a touchdown by the franchise since Mel Gray in 1988. It was the first playoff win by the franchise since the Oilers won back in 1993. 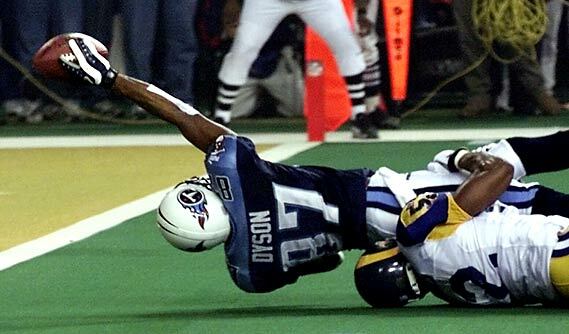 The Titans would go on to play in Super Bowl XXXIV against the St. Louis Rams. This Super Bowl consistently makes the top 10 lists as one of the best and most memorable Super Bowls ever. League MVP Kurt Warner led the Rams to the championship game and his back story is the subject of movies. The Rams season was likewise described as magical and this season began what became known as the Greatest Show on Turf. The game was a close one and once again came down to the last play at the end. The early portion of the game featured great defensive play and the Rams led at halftime by a margin of 9-0. In the end it came down to the offenses led by Warner and McNair. Titans kicker Al Del Greco missed a field goal early in the second half, his second of the game, and the Rams scored a touchdown on the following drive. The Titans quickly reciprocated and the game was tied at 16 all with a little over two minutes left in the game. The Rams had only one successful drive in the 4th quarter and Warner only completed one pass in that quarter but it was a game winner. He threw a long pass to wide receiver Isaac Bruce he caught it at the Tennessee 38 yard line and returned it for a 73 yard touchdown giving the Rams a 23-16 lead. The Titans started their final drive with 1:48 left on the clock after a holding penalty on the kickoff return backed them up to the 12 yard line. They drove down to the Rams 10 yard line with six seconds left on the clock. They had time for only one more play. This play goes down in NFL history as “The Tackle.” Trailing by only a touchdown the Titans were 10 yards away from tying the game and taking it into the first ever Super Bowl overtime period. The play as designed used tight end Frank Wycheck as a decoy to lure linebacker Mike Jones away from wide receiver Kevin Dyson. Wycheck ran up the field to the right as planned and Jones followed along. He glanced back and saw a wide open Dyson making the catch. He quickly closed the distance as Dyson ran toward the end zone and tackled him at the two and a half yard line. Dyson would attempt to stretch the ball over the end zone line but he was not successful. The Titans comeback from being down 16 points set a Super Bowl record for largest deficit ever erased. The Tackle as it became known consistently makes the top 100 list of all time great sports moments and the top 50 of all time Super Bowl plays. Mike Jones himself would make the NFL Network’s “Top 10 One-Hit Wonders” list. The Titans won a lot during their early years and made the playoffs six times. Sadly, their last playoff appearance was in 2008 where they lost to old nemesis the Baltimore Ravens in Nashville at what was know known as LP Field. Since that 2008 season the Titans have only one winning season. Ironically, that last winning season was in 2011 under former head coach Mike Munchak who replaced long time head coach Jeff Fisher who fired during the 2011 offseason. Fisher of course infamously battled behind the scenes per reports with former Texas Longhorns quarterback Vince Young who the Titans drafted at the behest of owner Bud Adams in 2006. Munchak’s tenure as the head coach was tumultuous as he only lasted from 2011 to 2013. Fans and some media began calling for his firing in 2012 despite the circumstances surrounding the Titans coaching change and the current status of roster. I wrote about the circus here. We now come full circle and the Titans have a new head coach in Ken Whisenhunt and they look worse than ever before. The team is 1-4 and going nowhere with no offensive or defensive identity. The Titans as an organization don’t seem to know or understand what it once meant to be a Tennessee Titan. They have allowed their fanbase to forget what it once meant too. This is perhaps the most damning failure of them all. Long gone are the days when the Titans won a lot and knew who they were both offensively and defensively. There are no Steve McNairs, Eddie Georges or Jevon Kearses. Titans tight end Delanie Walker is the closest they have ever come to a Frank Wycheck. I remember the Titans even if no one else does. I remember the early days at Adelphia Stadium when the team and the city had a pride and connection associated with it. I remember the Music City Miracle. I remember the Super Bowl. I may be the lone voice crying in the wilderness but I will not let that legacy die. It’s worth fighting for. I remember when the Titans were one of the toughest teams in the league. The Tennessee Tyrants led by Titans great linebacker Keith Bulluck. I remember when fans filled the stadium and teams called Nashville a tough place to play. Those days seem long gone too. No one remembers the Titans because the Titans organization is a rudderless ship in dire need of leadership and command. Wow, nice long interesting and informative. Great article, Sharona! I’ll never forget the “Music City Miracle” and the controversy on whether or not it was a lateral. I think we’ve ALL seen the computer results that show that it was indeed a lateral – barely – but it was! I also remember all the players you mentioned as well as LB Keith Bulluck. McNair, R.I.P., was one of the toughest football players ever! Of course, I remember the “tackle” in the Super Bowl. Talk about “The Longest Yard!” You brought back a lot of memories and I’m not even a Titans (or ex-Oilers) fan as you know but Jeff Fisher almost always fielded a competitive team…he seems to have “jumped the shark” so far in St. Louis….ironic, considering that Super Bowl, huh? Wonderful piece, girl! Keep up the great work!! Thanks Ken! I really appreciate it and thanks for reading!